The notion that highly creative people tend to be eccentric or even a little “crazy” is not just a stereotype. New research in the journal Nature Neuroscience has shown that people who are genetically predisposed toward schizophrenia or bipolar disorder are likelier to be artists or a member of the creative professions. Because creativity, by definition, requires people to “think different” as Apple would say, it is reasonable to speculate that creativity and psychiatric disorders are related and perhaps even share similar genetic mechanisms. The main question plaguing researchers, however, is whether this link is primarily due to genetic or environmental influences. So, a team of international researchers set about shedding more light on the matter. Previously, research has shown that creative people are likelier to be bipolar, and writers, specifically, are likelier to possess some sort of mental illness. (This is beginning to concern your humble correspondent.) Additionally, people who possess genetic risk factors for schizophrenia, but are not actually schizophrenic, still show abormal thought patterns. It stands to reason, therefore, that people who have a few, but not too many, gene variants (“alleles”) associated with mental illness might stand to benefit from a boost in creativity. However, a separate analysis (“CAQ-Arts Score”) based on a numerical measure of a person’s creativity failed to produce a statistically significant result. 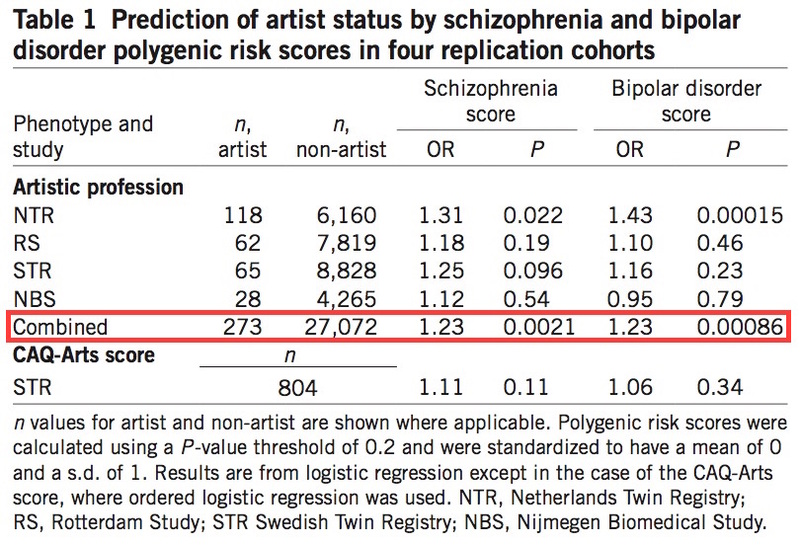 Moreover, the ability of polygenic risk scores to explain variation in creativity is fairly limited. Indeed, the authors found that only about 0.25% of the variation in creativity could be explained by a genetic predisposition to schizophrenia or bipolar disorder. That means that 99.75% of the variation in creativity between individuals is explained by other genetic factors or by environmental factors. Now, it must be pointed out that miniscule results like this are quite typical of such studies. Last year, a study reported that a genetic predisposition to schizophrenia explained less than 1% of the variance in marijuana use. Clearly, this data is informative, but of limited utility. Until we have a more comprehensive understanding of genetics and genomics, we will have to settle for finding one tiny piece of the puzzle at a time.